This intensive three-week field course focuses on the behavioral ecology of African mammals in their natural habitat. The course curriculum is designed to exploit the extraordinary richness, diversity, and observability of the mammalian fauna inhabiting Kenya's protected areas. 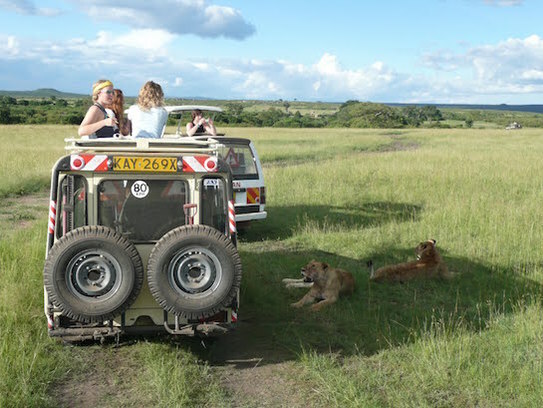 The majority of the course will be conducted in the Masai Mara Game Reserve. Situated in the northern portion of the Serengeti ecosystem, the Mara contains savannas, acacia woodlands, and riverine forests, and these habitats are occupied by different groups of mammals. Throughout the course we will use our bush vehicles as classrooms and mobile "blinds" from which to observe the behavior of resident herbivores and carnivores. Although most of our work in this course will be observational in nature, students will also receive instruction regarding how to capture and handle particular African mammals. Finally, this course will offer students a unique opportunity to learn about the cultures of Kenya, particularly the indigenous Maasai who inhabit the areas surrounding the Mara. BEAM is offered through the College of Natural Science and the Department of Integrative Biology (formerly Zoology), and is arranged through the Office for Education Abroad. Once accepted, students are required to enroll for six (6) credits in IBIO 490, Overseas Study in Zoology.